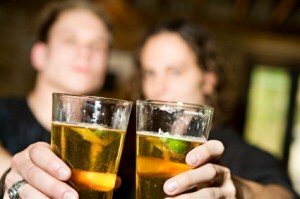 Can people force you to drink alcohol if you don’t want to? Don’t say yes if you want to say no. Recently a client told me that he would like to drink less alcohol, but he was concerned his job wouldn’t allow that. He explained that it was customs when he met with his boss and colleagues or with customers that he had to drink beer. A lot of beer! If you are having a beer and you enjoy it, I think it’s a great thing. If you feel you “have to” drink beer in such quantities that you are compromising your health just because of peer pressure, something is seriously wrong! Let me tell you that no one has the right to force you to drink alcohol if you don’t want you. Just like no one has the right to cause you direct physical harm, no one has the right to harm your health indirectly. I also drink beer, wine, coffee… But once in a while and in limited quantities. And always in a way that I can enjoy it. And I am in control of the process. Sometimes I will refrain from alcohol or coffee for a while, just to reinforce the confidence that I am still in control. Friends of mine do the same, some even don’t drink any alcohol at all, or they are strict vegetarians. Guess what happens when they go to a party where “everyone” else is drinking alcohol or eating meat, and they don’t participate in such activities? Never have I seen anybody making fun of them. Because my friends know how to say no with confidence. Only if you do not accept yourself the way you are, you “have to” do things to please others. If you are connected to your true self, you can say what you want. You can stand up for the values that are important for you (e.g. your health! ), and you will see that other people not only accept your decision, they will respect you. They will respect you more than they would respect a yes-sayer. In the rare occasion that people try to mock you, let them. It is just a sign of immaturity, a sign of their own lack of self-confidence. They will hear your message, and if they laugh at you, then this is because you scare them. You don’t want to be with such people, and you definitely don’t need such people. When you feel “no”, say “no”. Say it with confidence. Life Is Easy. We Humans Make it Complicated. Scarcity – What do you need to do to have zero regrets on your death bed? Hi Poyel, thanks for your comment. I hadn’t heard the Voltaire quote yet; love it. Hi Dr. G.,long time, no talk. Dr. Wayne Dyer speaks to me about these issues in his lastest book, “The Shift”. There’s a movie associated with the book and it’s not just a video of Dr. Dyer giving a talk, but rather intertwined stories of people illustrating his points. It’s pretty good, you might enjoy it. Take care of you. Deb B.